Latina Lista: News from the Latinx perspective > Causes > Social Justice > Colombian police on active patrol for — lying politicians! LatinaLista — Over the last several decades, Colombia has weathered a spate of bad publicity. Whether it was their infamous drug cartel (Pablo Escobar) history or its decades-long civil war, or the rampant corruption that, unfortunately, exists in most Latin American countries, Colombia would not be the first place most people would expect to find law enforcement spearheading a campaign targeting lying politicians. Yet, the politicians in Colombia are on notice to tell the truth when they’re on the campaign trail. If not, the country’s National Police will call them out publicly, and if egregious enough, arrest them. As a response to the U.S. discovery of Russians spreading false information during the 2016 presidential election, Colombia’s President Juan Manuel Santos created an electoral intelligence unit. Its purpose is to expose and investigate disinformation used for political gain. As a result, the police are taking their patrols to cyberspace. 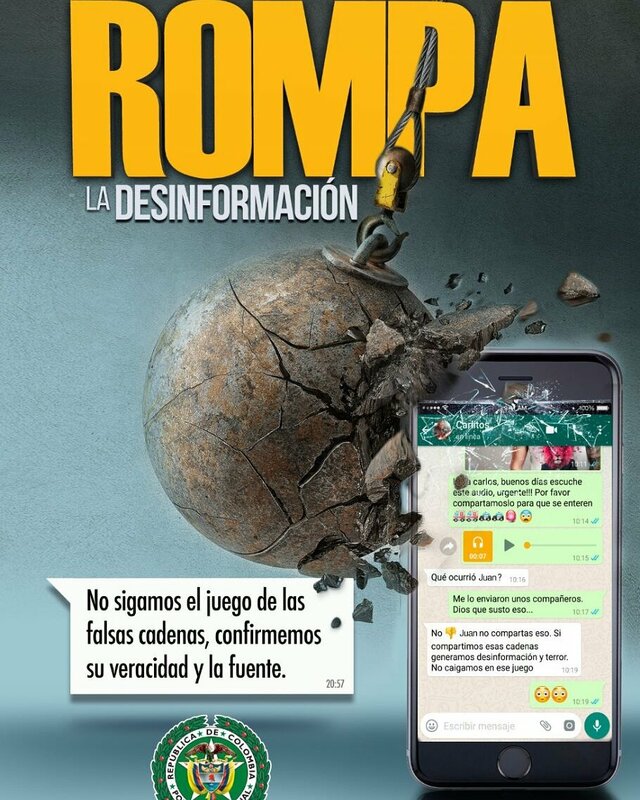 They monitor the tweets, images, snaps and posts of politicians and their supporters, and when something is misrepresented, they call it out as fake news under the hashtag: #RompaLaCadena. The police are trying to make Colombians think twice before they share anything online, asking people to verify their sources and reminding them that spreading false information is against the law.